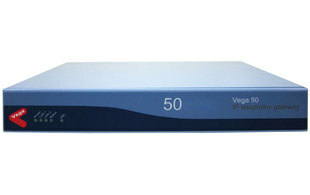 The Vega 50 media gateway connects a range of legacy telephony equipment, including PBXs, ISDN telephones, the ISDN, analog phones & the PSTN to IP networks. The Vega 50 media gateway supports up to 10 analog ports, or 8 basic rate ISDN channels on 4 physical interfaces. Vega 50 media gateways support ETSI BRI. Analogue Vega 50 media gateways support standard loop start signalling. Vega 50 media gateways have proven interoperability with a wide range of existing telecommunications and VoIP equipment. All VegaStream gateways can support SIP, H.323 & T.38 FAX. The gateways can be configured for different country requirements, such as tones and line impedance. Vega 50 media gateway variants equipped with FXS ports are also fitted with two FXO ports. When powered the Vega can route calls to or from these two FXO ports. Under power failure conditions the two FXO ports provide a hard-wired bypass to two FXS ports allowing PSTN calls to be made even under this failure condition.